India's Supreme Court has ordered petitioners calling for a ban on the film about Prime Minister Narendra Modi to provide evidence that the biopic would destabilise elections that begin this week. A ruling is expected on Tuesday. The feature, named simply PM Narendra Modi, stars Bollywood actor Vivek Oberoi. It charts the rise of India's prime minister from humble beginnings as the son of a railway tea seller to becoming first minister of Gujurat before being elected prime minister. A senior member of the opposition Congress Party has taken exception to the fact that three of the film's four producers are members of the ruling BJP Party, and the intended 11 April release date coincides with India's general elections. The fear is that if the film is released in cinemas on Thursday that it may sway voters in favour of Modi who is running for a second term in office. So a petition has been filed to the Supreme Court asking for the film to be banned. On Monday, Chief Justice Ranjan Gogoi ordered the lawyer representing the petitioner to provide proof that the film risked disrupting India's election. Gogoi also pointed out during Monday's hearing that the film trailer has been approved by the country's Central Board of Film Certification, which led him to doubt the same body would ban the movie. The hearing is to continue on Tuesday 9 April and a ruling is expected later in the day. Opposition members are also up in arms about the launch of a 24-hour TV channel called NaMo that is devoted to broadcasts about Narendra Modi. It began broadcasting on Sunday 31 March, less than a fortnight before India goes to the poll. 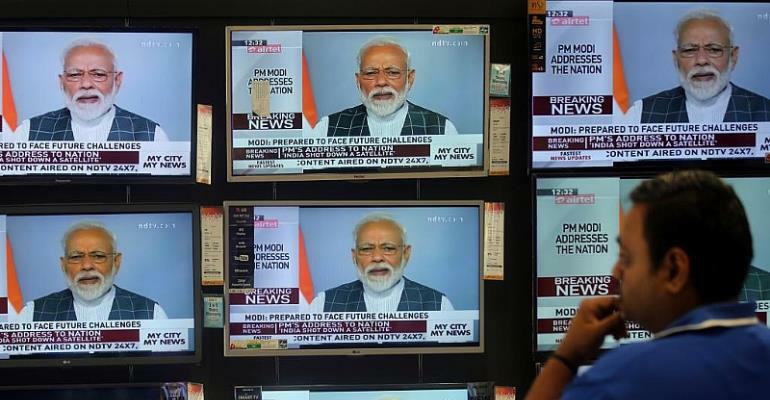 The timing of the channel's launch and the impending release date of PM Narendra Modi have led the opposition to accuse Modi's BJP of manipulating the media to gain votes. Both the Congress Party and the Delhi based Aam Aadmi Party have lodge complaints with the country's electoral commission. India has strict rules governing the creation of news channels. NaMo TV executives argue the channel is devoted to promotion rather than news, and so is not subject to the same requirements. It is currently available on most major cable and satellite providers. India holds general elections starting 11 April in the world's largest democratic exercise - 900 million people are eligible to vote. Modi is seeking a second straight term, with Rahul Gandhi of the Congress party his main challenger. Results for the 543 parliamentary seats up for grabs will be announced on 23 May.